For about two months now I have been practicing The Lesser Banishing Ritual Of The Pentagram (LBRP). The Lesser Banishing Ritual Of The Pentagram is said to have many benefits once someone performs it. This ritual is often used within Ceremonial Magick and other esoteric traditions like for example, The Hermetic Order Of The Golden Dawn or The Brotherhood Of The Rose Cross. However this ritual can also be practiced on it`s own once or twice a day, morning and or night. There is many examples of this ritual online if you Google it. However a large amount of sites just post the ritual and lack the meaning behind it. I don`t know about you, but with me I like to know some of the meanings behind a ritual before putting it into practice. As I really can not understand why someone would want to practice something they do not understand. To me this would call into question whether the ritual would in itself have any benefits to the person performing it. I have decided in this article, rather than explaining what benefits the Lesser Banishing Ritual Of The Pentagram may have going by ancient writings. I will explain the benefits and experiences I have got out of this ritual. Some of the things I have found that makes a ritual more powerful and more likely to work is when I add my own feel to it, incorporate my own ideas into the ritual itself. Other things are visualisation skills, focus, concentration, the vibration of the spoken words, time of day and more. I have found that if I keep to the basic structure of the ritual but add in my own ideas then the ritual itself becomes more your own. Some of the benefits I got out of The Lesser Banishing Ritual Of The Pentagram came almost right away which surprised me. When you start to feel or see the results, that`s when you know the ritual is working. However, like any ritual or spiritual workings it takes practice and discipline to get there. I guess if I had not already been apart of other esoteric groups over the years which had some of these methods already added into them it would take a lot more time. However I remember being part of these esoteric groups and performing rituals without anyone explaining what some of them where all about. We were some how all expected to know and to learn very quickly. One of the things that I noticed right away after preforming The Lesser Banishing Ritual Of The Pentagram was the sense of a heaviness in the air being lifted. Due to being a medium and working with Instrumental Trans-Dimensional Communication (I.T.C). A lot of earthbound spirits in the astral realm gather around me each day. Some of these energies are not so positive or friendly as it takes all kinds. I have felt that this ritual clears a lot of these energies, if still in my house or left behind. A lot of people use sage as a method to clear away unwanted energies that are around. I would say if you are looking for something a little stronger then The Lesser Banishing Ritual Of The Pentagram should work well. Another thing I noticed right away is that my partner often came home from work a little on edge, now I perform this ritual things have been different. For a number of months one of my animals that had always been very affectionate had a complete change in personality. She became very aggressive towards my other animals and even biting me at times for no apparent reason that I could see. After starting The Lesser Banishing Ritual Of The Pentagram my beloved animal has become less stressed and aggressive. The change in my home environment has been very different and noticeable in almost all area`s for the better. So after performing this ritual I have found it to be a very powerful and positive ritual. Some of the other benefits I have found is that it helps you learn to focus, visualise and vibrate the sound of the spoken word or words of power at the right level/frequency. With this ritual, if you already practice the esoteric arts then please feel free to use your altar and it`s tools and also a physical circle if you have the space to set one up. If not, that is fine also and means that you will be using more visualization. I myself have an altar setup and the rest I visualize, the tools and props are really there to help you to focus, put you in the right frame of mind and set aside a place away from your daily space to do spiritual workings. As this ritual, when practiced really helps with visualization and focus, the more you can visualize the better. I sometimes use an altar knife or wand and sometimes just my pointer finger. If you are using an altar, you should have something that represents each element on the altar, Earth, Air, Fire, Water and Spirit. Another thing you may like to have is any deity that you feel connected with on your altar. You can have a bell on your altar, I use a bell to ring on starting a new part of the ritual. Also some good quality incense is good, sometimes I use white sage incense and other times I use Frankincense incense on the altar. Frankincense is very powerful when it comes to driving away unwanted energies and was the incense that was given to the Christ by the Three Wise Magus. The Qabalistic Cross part of the ritual draws on part of the Lords Prayer and also of course, the Kabbalah. However the Kabbalah is not needed to be learned to achieve good results with this ritual. In any case, to learn all of the teachings of the Kabbalah would take you a lifetime of studies in itself. In the Kabbalah, however is different Hebrew words that represent divine beings. These words if pronounced right and vibrated as sound at the right level are very powerful. One of the reasons these words are so powerful is not just due to the fact they are Divine names, but also that Hebrew is a very ancient language, another powerful language is Latin. Also anyone that has studied the esoteric path should know that sound vibration can be very powerful in deed. Thou art, the Kingdom, the Power and the Glory, Forever...Amen. Here in this ritual you will be speaking it in Hebrew, how it is pronounced within the Kabbalah. Try to find a place away from being heard if you are worried about others hearing you as it is best if you say the words out loud. If you say them in a slightly higher pitch than your normal voice, feel the words vibrate as you say them, allow the sound of your voice to travel evenly and smoothly much like if you where chanting UUUUMMMMM. (breath in and vibrate the word on breathing out). If you have to open your eyes to see the word to remember it, this is fine. However after practicing this ritual for awhile you should be able to remember these words. I found that the visualization came very quickly and the words took a bit more time to learn, but i was still getting good results. What was important was the way the words where vibrated and the visualization, focus. Still facing East, as you will remain facing East through part 1. of this ritual, touch your breast area and say : Malkuth. Feel the bright light travel down to this area of your body and then right down in a straight line into the floor. You should now be able to visualize a bright light going from the top of your head right down and through the floor near your feet. Visualize a bright light at your right shoulder, just as you did before. Visualize a bright light in a straight line going from your right shoulder to your left shoulder. You should now be able to visualize a bright light going in a straight line up above your head and also below your feet. You should also see a bright light going out past your right shoulder, across to your left shoulder and out passed the left shoulder forming a glowing cross through your body. Hands still together, point up or point the knife up and say : Amen. In this part of the ritual you will be drawing in all four cardinal directions the Banishing Earth Pentagram. 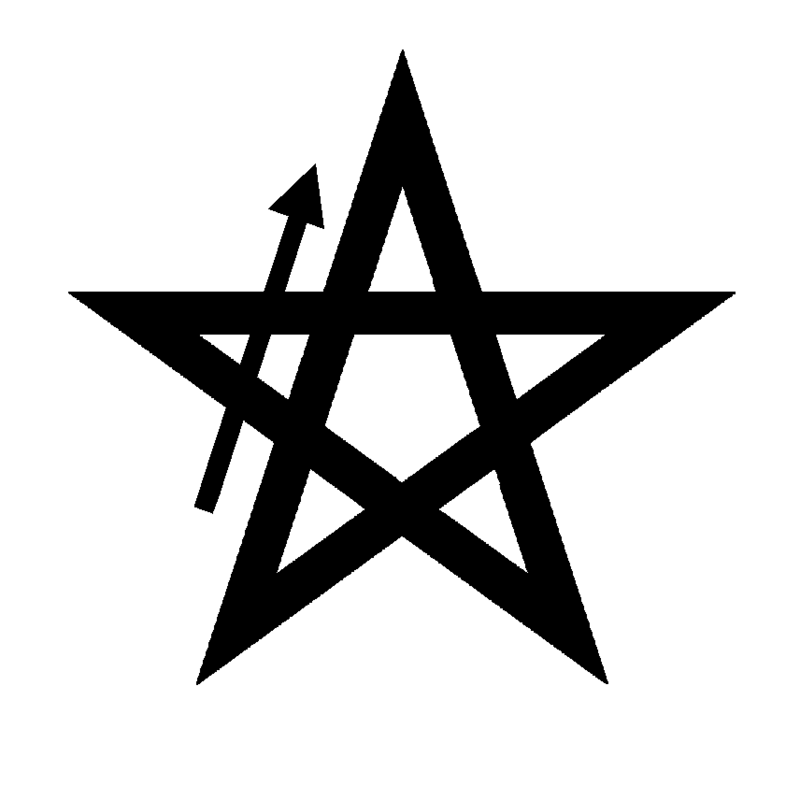 Starting where the arrow is and then finishing at the same place, this pentagram will be drawn in the air above you. Visualize them glowing bright red in each direction and as you move from direction to direction see a ring of bright light joining all of the glowing red Earth Pentagrams together. then keep moving to the right and back to behind your altar. Another thing you will be doing in this part of the ritual is the Sign Of The Enterer and the Sign Of Silence. When doing the Sign Of The Enterer you step forward with your Left foot first and thrust both your arms forward as you blow your head at the same time. Your hands should be directly inside the middle of the Red Glowing Pentagram. You vibrate out loud the Word Of Power while thrusting your arms forward. After this, you come back to a standing position and bring your left hand upto your mouth with your pointer finger pointing up, pressed against your lips in the Sign Of Silence. After this is completed you then move on to the next cardinal direction. Go around the left side of your altar if you have one and stand facing the East. Draw in the air the Earth Banishing Pentagram, visualize it glowing bright red. 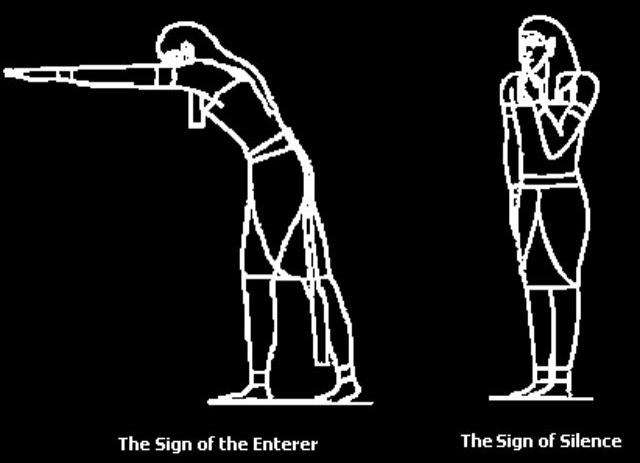 Then thrust your body forward in the Sign Of The Enterer while vibrating out loud the word : Yod - He - Vau - He. Feel the vibration of the word going through the Glowing Banishing Earth Pentagram out into the universe. 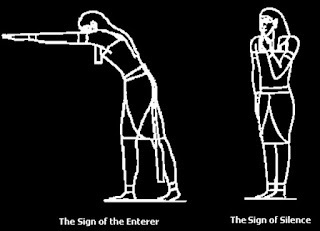 Then return to a standing position and make the Sign Of Silence. Now go to the South cardinal direction and repeat the drawing of the Earth Banishing Pentagram, The Sign Of The Enterer and vibrate out loud the word : Adonai, then the Sign Of Silence. Now go to the West cardinal direction and repeat the drawing of the brightly glowing red Earth Banishing Pentagram, The Sign Of The Enterer, vibrate out loud the word : Eheieh, the The Sign Of Silence. Now go to the North cardinal direction and repeat drawing in the air in front of you, the brightly glowing red Earth Banishing Pentagram, The Sign Of The Enterer and vibrate out loud the word : Agla, then do The Sign Of Silence. Now return to the East in front of your altar, finishing the circle, all the glowing red pentagrams should be all joined up by a circle of bright light. If you are having trouble visualizing all this, it will come with time and start to become stronger and stronger. While standing there in the East you could close your eyes and try the visualize the joined circle and pentagrams in each direction. After this return to your altar via the right side, you should always leave your altar via the Left side and return via the Right side. Before me Ra-pha-el (the Raphael needs to be spoken as in a vibration). Try to visualize these Angelic Inter-Dimensional Beings arriving at each cardinal direction as if through teleportation, see them standing there in the circle. If you see them like I do, they are very tall. I have got to the point where I can feel everything, the glowing banishing earth pentagrams, the Angelic Entities. The other day, before I even started the ritual the four Angelic Entities where there waiting for me and I had not even done the Sign Of The Enterer or Invoked them. Do not worry if you can not achieve this yet as it will come with time, I can invite beings/Entities into my house through telepathy these days. Say : Before me flames the Pentagram, within me shines the Six -Rayed Star. Say this with your eyes closed and visualize the glowing pentagrams, the Angelic beings and the six-Rayed Star shining within you. As you get a little more experienced at The Lesser Banishing Ritual Of The Pentagram. 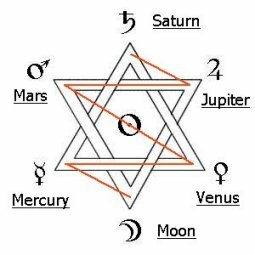 Rather than using all Earth Banishing Pentagrams for each cardinal direction you can use the right Banishing Pentagram for each direction. I hope you have found this article helpful as I have found this ritual to be very helpful as I have explained above. Please feel free to comment below if you have a question in relation to this article thanks - (C) Orion Silverstar 2016. Just finished doing this ritual. Very simple to do, I loved it. The visualization at the end and through out was very powerful. Thanks Geoffrey Green​ I felt very protected and more power inside, so Thanks. I will let you know of any other changes around today!